As people age, it can be more difficult to get up from a seated position, or off the floor. The products in this category range from providing a little extra 'umph' to get out of a chair to assisting someone that has fallen to the ground. Feel free to call one of our product specialist if you have any questions. The Leg Lifter is a simple solution for positioning your legs when seated or in bed. UpEasy Seat Assist Seat Assist is a mechanical lifting cushion that will ease you into your seat, as well as help you up. UPEASY Power Seat is an electric-powered cushion that will lift you effortlessly from your favorite armchair or sofa. It is also easy to move from room to room inside your home. Power Seat is easy to operate with a simple flick of the power lever, and you can stop any time or height you want. It is designed for indoor use beside a power outlet, either at home, or wherever you are visiting. with minimal assistance The Mangar ELK is a compact, battery powered lifting cushion uses a battery powered air compressor to swiftly (roughly 2 minutes) lift one from the floor up to 22 inches. The HFL will lift a person up to 300 or 400 pounds from the floor to a position seated at the height of a standard chair - 21 inches. 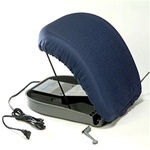 The Mangar Camel Lifting Cushion is an air powered cushion designed to sit up and lift a fallen person from the floor. 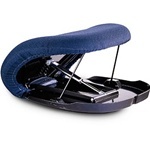 The adjustable back support allows the patient to use the lift without the assistance of a caregiver.